We now support showing an in-line type hierarchy view (Command-T on the Mac and Ctrl-T for Linux and Windows). 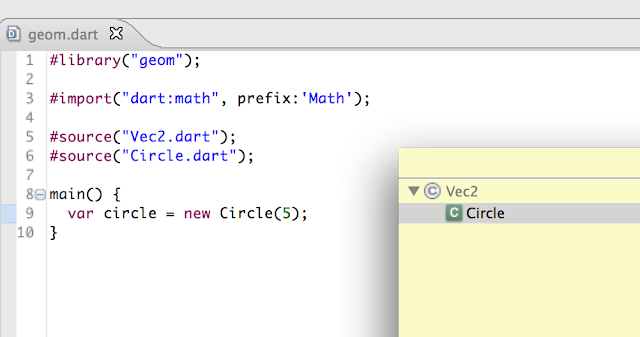 We have a new Quick Fix to import or create a type when it is used as invocation target. showing proposals for function parameter names following unary-? Web components support is now enabled on Dartium launches by default. The .project metadata file has been moved out of the user's source directory. The html and css editors now use a default indent of two spaces. 6 analysis fixes, as well as fixes to the debugger, Outline view, feedback dialog, auto-update, and our analyze-as-you-type feature. And as always, view the changelog for the full list of changes, and to get started with the Editor see our tutorial. Const, Static, Final, Oh my! "static" means a member is available on the class itself instead of on instances of the class. That's all it means, and it isn't used for anything else. static modifies *members*. "final" means single-assignment: a final variable or field *must* have an initializer. Once assigned a value, a final variable's value cannot be changed. final modifies *variables*. Dart 1.12.0 is now released! It contains the new null-aware operators language feature, and enhancements to pub, Observatory, dartdoc, and much more. The new null-aware operators help you reduce the amount of code required to work with references that are potentially null. This feature is a collection of syntactic sugar for traversing (potentially null) object calls, conditionally setting a variable, and evaluating two (potentially null) expressions. Click or tap the red Run button below to see them in action. if null operator. `expr1 ?? expr2` evaluates to `expr1` if not `null`, otherwise `expr2`. null-aware assignment. `v ? ?= expr` causes `v` to be assigned `expr` only if `v` is `null`. null-aware access. `x?.p` evaluates to `x.p` if `x` is not `null`, otherwise evaluates to `null`. null-aware method invocation. `x?.m()` invokes `m` only if `x` is not `null`. Learn more about Dart's null-aware operators in our Language Tour.